I read The Da Vinci Code by Dan Brown against my better judgment and despite the advice from many intelligent people I respect. Honestly, if no one had told me how popular it was I would have assumed it was a bargain basement mystery novel. To be fair, that's exactly what it was. If the author hadn't drummed up interest by throwing in a lot of crazy anti-Christian conspiracies no one but his mom would have read it. The writing is incredibly bad on its own - no need to argue about his ridiculous theories. So, why read this one? Good question. It's not like I felt Brown needed any rebuttal any more than Bigfoot nuts or alien abductees do. I just thought the authors of this book might have something interesting to say about the subject and it was included in my Deseret Book Plus membership and it was short. Okay, maybe that last factor was the biggest draw. I was in the mood for something that wouldn't take more than a minute and this one fit the bill. This is not technically a book, not in the format I consumed, anyway. 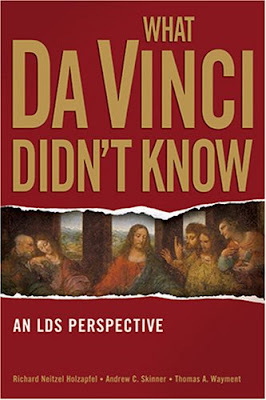 It's actually a recording of three LDS scholars who chat about the problems with The Da Vinci Code and their rebuttals for Brown's theories. It was an entertaining, informative, and short listen and did a great job with what they set out to do, outlining the LDS perspective. If you are LDS and thought Brown had any credibility, then give this a listen. Otherwise, it just gives more attention to a thoroughly forgettable, third-rate novel. The biggest mystery about The Da Vinci Code is how it got so popular. C'mon people, we can do better.